This week, in the real world, Ireland has gotten some of it's hottest weather in a very, very long time. Our own talented artist Triona Farrell herself has been complaining of melting in the heat. 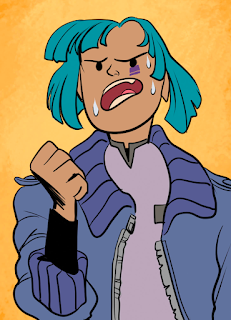 So consider me quite surprised with the timing of the latest page of Ship Wrecked to mirror our temperature problems. I wrote this page back in April. Who knew I was such a prophet! I won't tell you what happens in any upcoming pages for fear of telling you your future. I've watched enough sci-fi to know all the temporal implications. Go read it. Or I'll send Aloe round.